The message is hopeful and features a rainbow of colors. 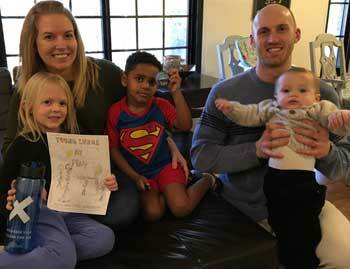 “Young Lungs at Play” created by Jordan Schulte, age 6, is the winner of the Yale Graduate Housing Tobacco-Free Poster Contest. The poster portrays children at play on green grass under a yellow sun, and includes Jordan’s mom, her two siblings Will and baby Micah, and her friends Roy, Quynh, and Laura. Jordan was quite excited to create the poster, especially since her mom, Samantha Schulte, is a respiratory therapist. Samantha has provided smoking cessation education and is an advocate for smoke free environments. “I’m so proud that knowledge is spilling over into the minds of my children,” said Samantha. The family moved to New Haven and into Yale Housing last year as dad, Justin Schulte, began his first year studying at the School of Management. The contest was open to children up to the age of 16 living in Yale Graduate Housing. Submissions needed to include the words Yale and tobacco free with the rest left up to their imagination and what they see as a tobacco-free world. Six posters were submitted, including one with a smoking bulldog and another with a steaming volcano. They were all very clever, colorful, and delivered the tobacco-free message. Every child who participated received a gift. Jordan’s poster was reprinted and is hanging in common areas throughout Yale’s Graduate Housing’s dormitories and apartments.